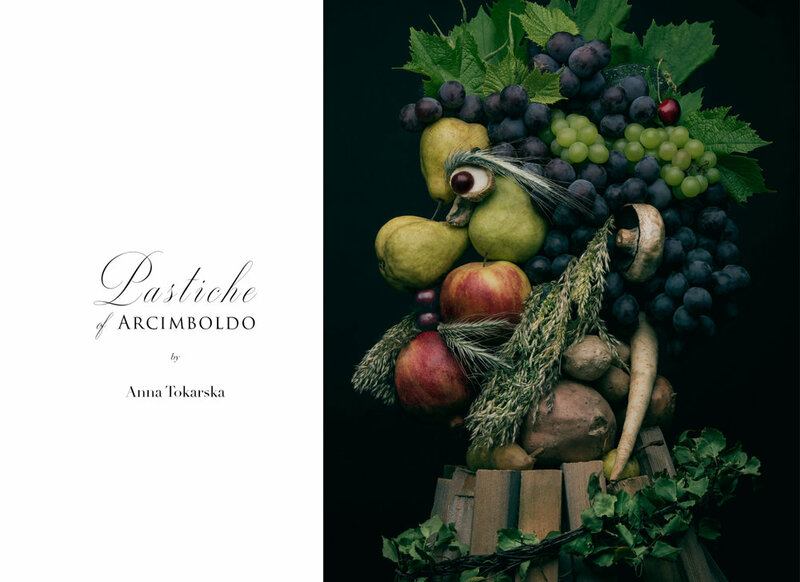 Arcimboldiana is a set of eight photographic pastiches inspired by the works of the Italian mannerist, often referred to as the precursor of surrealism, Giuseppe Arcimboldo. The inspiration behind the concept is my interest in pastiche as a means of artistic expression. 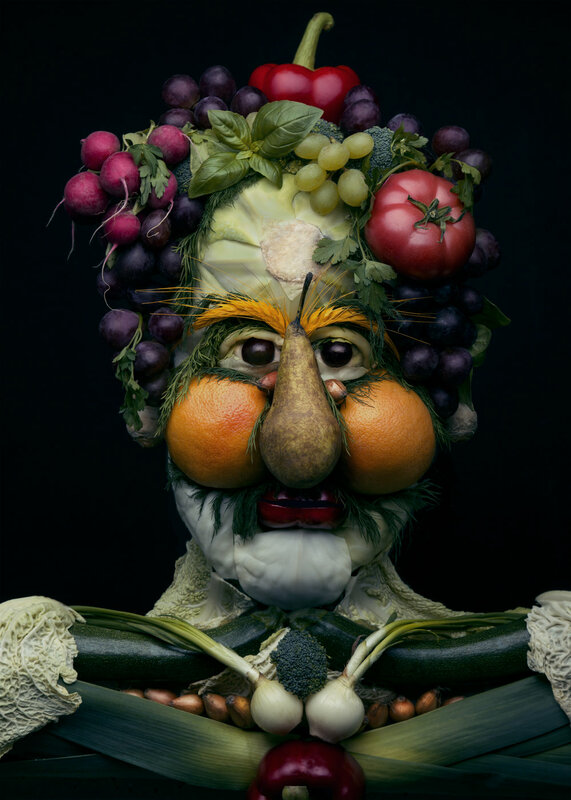 Arcimboldo, b. 1527 in Milan, was a versatile artist, who for twenty-six years remained in the service of the Habsburgs, serving as court painter and favored advisor to the emperor for artistic matters. 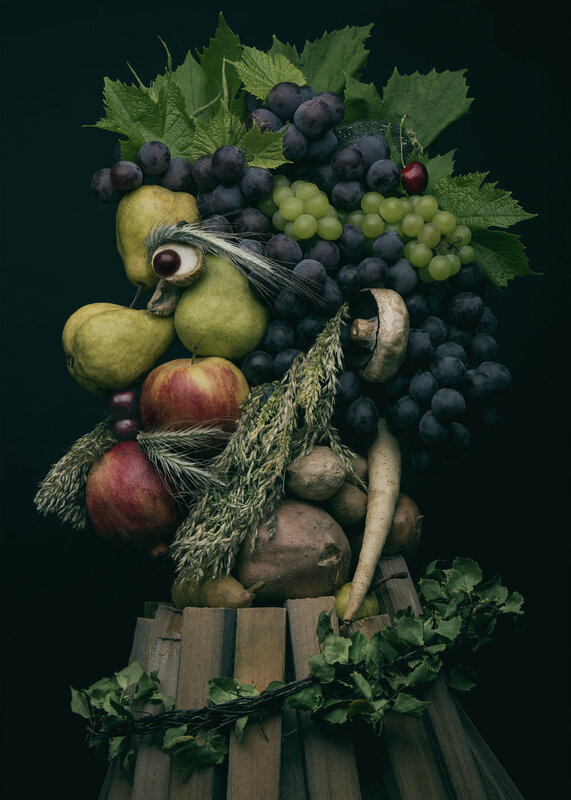 Arcimboldo's specialty were the so-called, allegorical portraits in which he used individual elements of the composition as carriers of subtle metaphors. 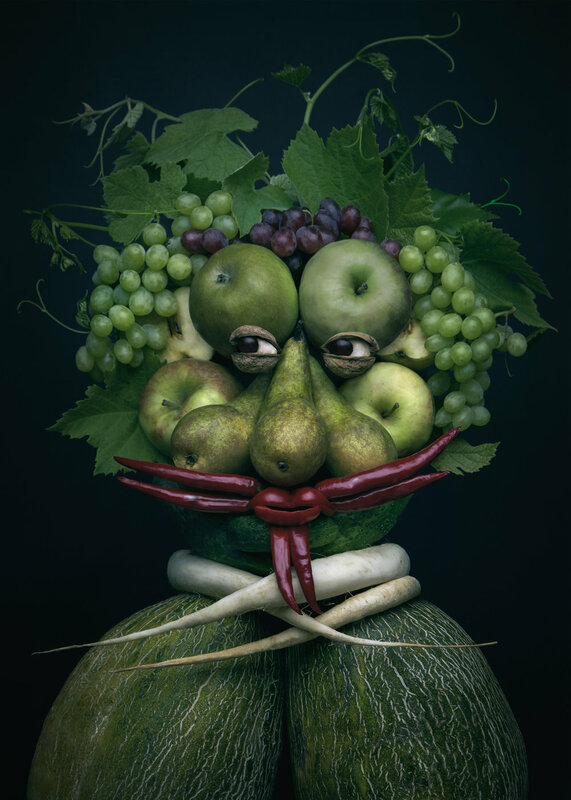 His paintings depict elements of still life; mainly fruits, vegetables, flowers, animals, roots and other vegetation, books or kitchen utensils that take on human form and character; a testament to his creative power of imagination. His painting met the mannerist principle called capriccio; an extraordinary work, unusual, bizarre, ingenious, which has the power to surprise the recipient and carry out a mental/optical play with it. Click on image to view in full-screen mode. — Carl Jung, "The Archetypes and The Collective Unconscious"
Pastische, as an important feature of postmodernism, is a creation that mimics the design of a given work, artist or epoch. In principle, it is cultivated to praise the style, emphasizing its characteristics, without criticizing it. It is an important artistic practice and can also be a testament to the artist's workshop skills. Its' shortest tradition is revealed in a purely aesthetic sense, rejecting intellectual interpretations. It does not refer to philosophical thought, as it did originally. The reinterpretation of tradition follows, leading to the loss of meaning of the original. Through conscious imitation of the original I take part in the creative space of the work and its creator. Although my style, intentions and mentality are certainly very different from the originator's intentions, it is still an attempt at dialogue with an unknown yet final result. In the presented set I am depriving the image of philosophical digression. I do not give meaning to particular elements of composition and I do not use hidden symbolism. For a wide audience, art became unattainable and incomprehensible. The lack of knowledge of history of art and philosophy, effectively discourages interpretation of the symbolic message. So I decided to create a set that is universal, legible, playful and fun. It presents some kind of workshop efficiency and pays tribute to aesthetics, which plays a very important role in my creative work. No comment on the historical-philosophical basis; I treat as an added value. Perhaps, these actions point to an anti-intellectual characteristic of artistic postmodernism, but at the same time it opens a possibility of communication with a wide audience. Arcimboldiana is also part of BA Defense Diploma, defended with honors, at the Academy of Fine Arts in Wroclaw, curated by prof. Piotr Komorowski. 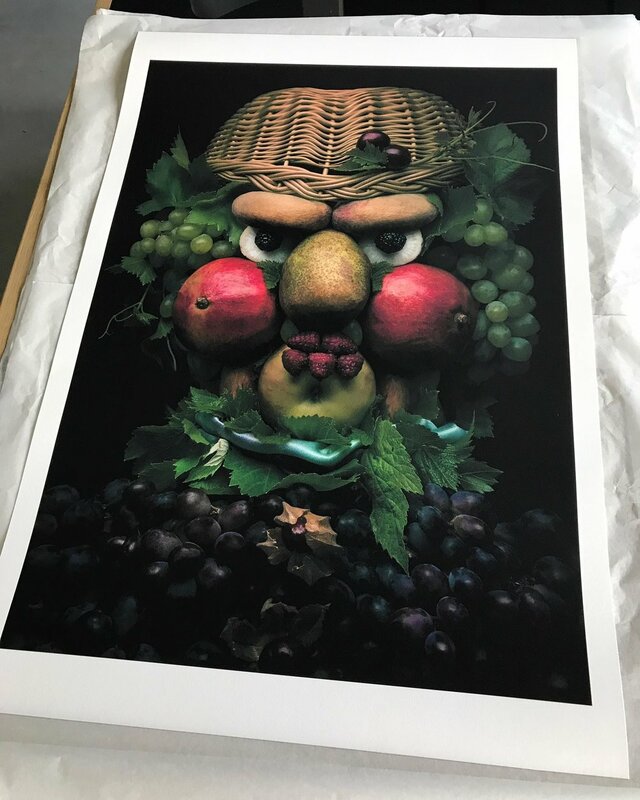 Limited edition artworks are printed on museum archival quality paper, Photo Paper Rag 308gsm, 100% cotton in pigment-free printing, by Hahnemühle Certified Fine Art printing studio in Poland. 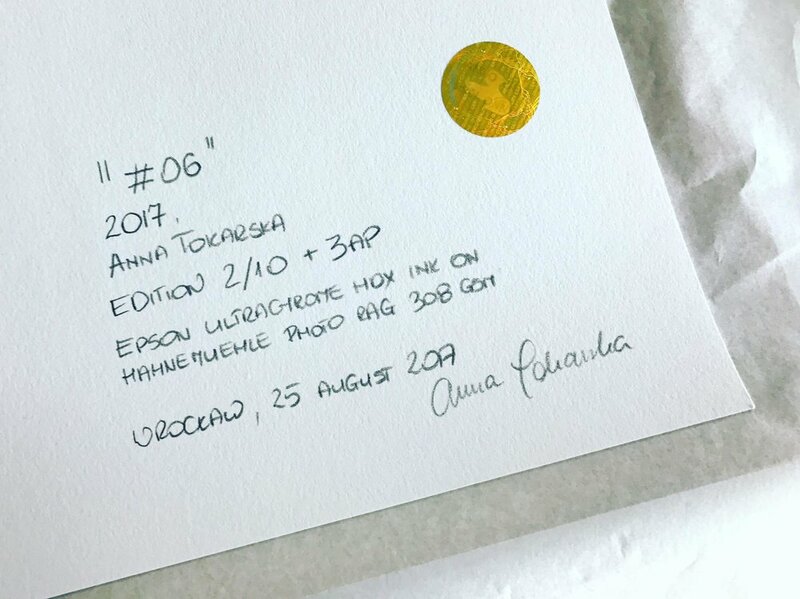 During the proofing process, Anna Tokarska works closely with her printer to reproduce a precise finish and color for every artwork. Each print is individually signed, numbered, and accompanied by a hologram system and Certificate-of-Authenticity by Hahnemühle and Digigraphie Certificate. The complete set consists of eight 50x70cm photographs for a 10-piece collectible circulation each, and 3 AP (Artist Proof). To an order, we attach a pair of white acid-free gloves to handle prints. Shipping is available worldwide. For more information click here, or to make a purchase enquire, please contact anna@annatokarskastudio.com.